The BOULDER ELECTRIC VEHICLE vehicles use the best available modern technology. We know that our customers don’t want to be guinea pigs for wheel motors, super capacitors, joystick steering or other over-innovations, just simple, reliable and cost-effective technology. That includes the most reliable lithium battery chemistry – lithium iron phosphate, AC motors which have 1 moving part and lightweight, rust proof composite materials. Lightweight composite materials have been used in airplanes since the1950s. Our advanced composite materials means better payload, better range and is virtually rust proof. The Boulder Electric Vehicle Cargo Trucks and Vans have great aerodynamics to improve range and drivability. Good aerodynamics means that the vehicle will use less energy and you will get more miles for the same money. Good aerodynamics also means a more stable vehicle in gusty winds. Lithium iron phosphate is the safest and most reliable of all the different lithium technologies, with a life span of 3000 cycles or more and only 1/3 of the weight compared to lead-acid batteries, this means lighter, stronger and longer lasting. The battery is mounted under the vehicle, protected from weather, dirt and impacts by literally bullet proof polycarbonate enclosures. The battery is built in modules, and in case of a battery problem, a service technician can use the touch-screen system to identify the problem and only THAT ONE specific module need be replaced. A battery management system is absolutely necessary for all lithium batteries. The battery management system makes sure that the battery gets charged properly, doesn't get discharged too far and warns the driver in case of a battery problem. Or simply spoken - the battery management system makes sure your battery's performance is at its best. 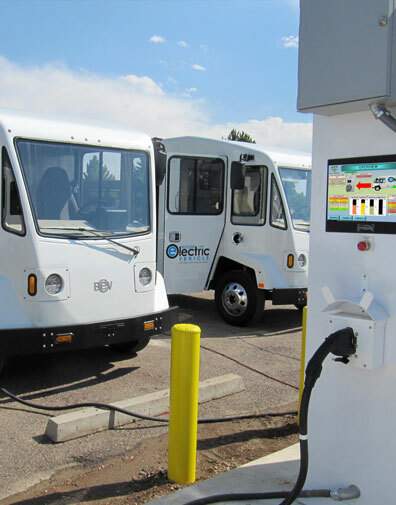 BOULDER ELECTRIC VEHICLE uses a BMS with proven reliability. The battery pack also has thermal cooling and heating to provide maximum performance in the Arizona summer as well in the Wisconsin winter.